NCERT Textbook Solutions are considered extremely helpful when preparing for your CBSE Class 8 Science exams. TopperLearning study resources infuse profound knowledge, and our Textbook Solutions compiled by our subject experts are no different. Here you will find all the answers to the NCERT textbook questions of Chapter 12 - Friction. All our solutions for Chapter 12 - Friction are prepared considering the latest CBSE syllabus, and they are amended from time to time. Our free NCERT Textbook Solutions for CBSE Class 8 Science will strengthen your fundamentals in this chapter and can help you to score more marks in the examination. Refer to our Textbook Solutions any time, while doing your homework or while preparing for the exam. Concept insight: When an object has already started moving (sliding), the irregularities on its surface do not get enough time to lock into the irregularities on the surface of the other object completely. Since the interlocking of the two surfaces is less when an object has already started moving, therefore, the sliding friction is smaller than the static friction. It is always easier to roll than to slide an object over another object. So, rolling friction is much less than sliding friction. Concept insight: The rougher the surface, more is the force of friction. When a book slides down on the tilted writing desk, a frictional force acts between the book and the surface of the desk. 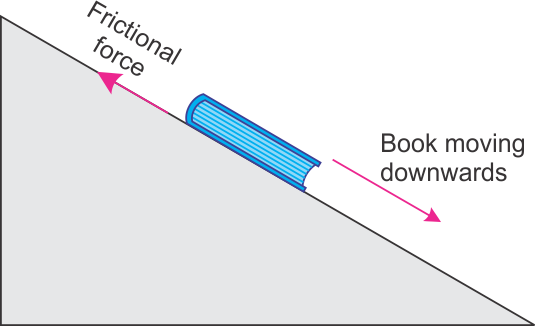 The direction of frictional force on the book is opposite to the direction of its motion and acts in upward direction, as shown in the following figure. Concept insight: Friction opposes the motion. If we spill a bucket of soap water on a marble floor, friction between our foot and the floor will become very less and so we will not be able to walk properly on the wet floor. We may also slip due to lack of friction. Concept insight: Friction is essential for walking. Sportsmen use shoes with spikes because spikes increase friction between the shoes and the ground and give a better grip while running. It avoids slipping while playing or running. Concept insight: Shoes with spikes increase friction. Force of friction arises because of the interlocking of irregularities of the two surfaces in contact. When a heavy object is placed on the floor, the interlocking of irregularities on the surfaces of box and floor becomes strong. This is because the two surfaces in contact are pressed harder. Hence, more force is required to overcome the interlocking. Thus, to push the heavier box, Seema has to apply a greater force than Iqbal who has to push a lighter box. Concept insight: It is difficult to push a heavier object because friction increases with the weight of object. In case of a heavier object, interlocking becomes stronger. When an object has already started moving (sliding), the irregularities on its surface do not get enough time to lock into the irregularities on the surface of the other object completely. Since the interlocking of the two surfaces is less when an object has already started moving, therefore, the sliding friction is less than the static friction. (i) We are able to walk because of friction. (ii) Friction between the tip of the pen and a paper allows us to write. (i) Tyres and soles of shoes wear out because of friction. (ii) Friction between different moving parts of machines produces heat. This can damage the machines. Concept insight: Friction is a necessary evil. When a body moves through a fluid, it experiences an opposing force which tries to oppose its motion through the fluid. This opposing force is known as the drag force. This frictional force depends on the shape of the body. By giving objects a special shapes i.e., streamlined shape, the force of friction acting on them can be minimized. Hence, it becomes easier for the objects to move through the fluid. Concept insight: Streamlined shape reduces fluid friction. TopperLearning provides step-by-step solutions for each question in each chapter in the NCERT textbook. Access Chapter 12 - Friction here for free.